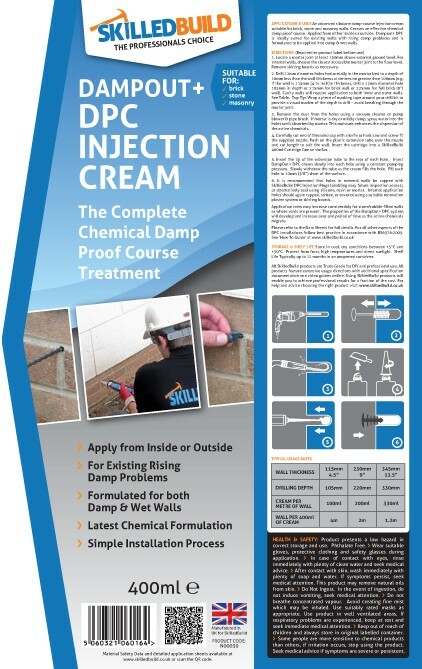 Need to Damp Proof your walls? No problem - Use Dampout+ Damp Proof Cream! 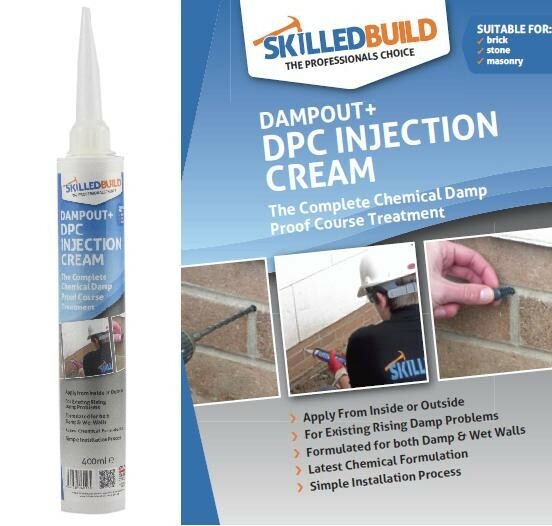 SkilledBuild's DampOut+ Damp Proof Cream is our next generation siloxane based injection cream used to treat Rising Damp. 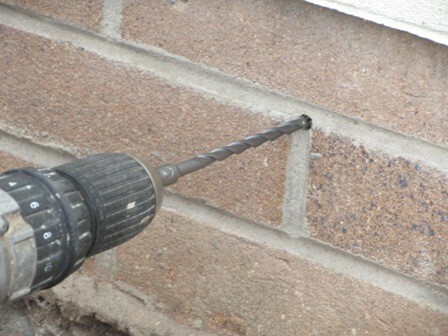 The Damp Proof Cream is easily installed by injection into 12mm holes drilled into the mortar joints of the brickwork of your property. 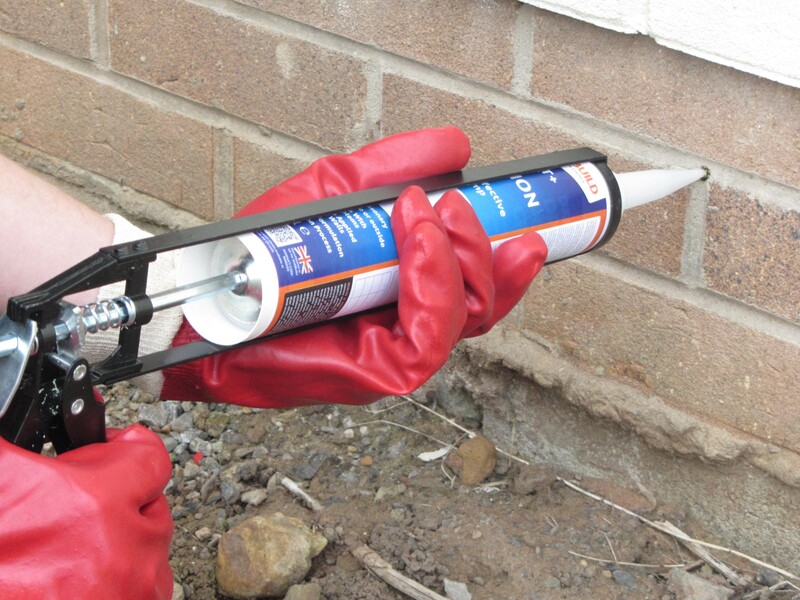 No specialist skills and specialist equipment are required to install the Damp Proof Cream. 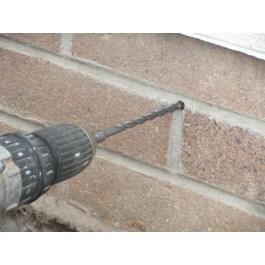 To install the Damp Proof Cream you only require a Caulking Injection Gun and a 12mm drill bit (as recommended below). See our detailed step-by-step instructions on How to Install Damp Proof Cream for more information. Dampout + Damp Proof Cream is suitable for masonry and brick walls, stone and concrete block which are built with lime or cement based mortars. The Damp Proof Cream can be applied internally or externally. Shelf Life: Up to 12 months if stored correctly in unopened container. Damp / wet brick walls. Damp / wet masonry walls. Damp / wet stone walls. Please note that this Damp Proof Cream is best suited for walls with existing damp problems and therefore already have wet walls. If the walls are dry then other methods should be considered as using this Damp Proof Cream may not result in the most effective results. 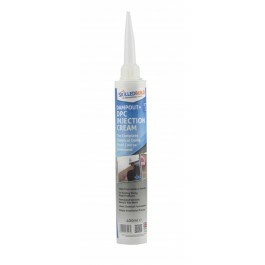 Standard Caulking Gun for 400ml Damp Proof Cream cartridges. Certified Armeg Drill Bits (12 x 300mm and 12 x 160mm). Follow this link to visit Product Pages for Damp Proof Creams and other Damp Proofing Products. 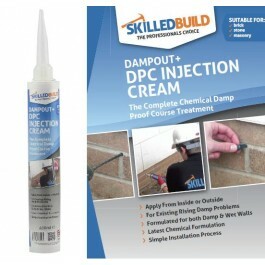 Our DampOut+ Damp Proof Cream is also available as part of a number of Kits. For more information, please visit out Product Data Sheet. Rising damp is caused by ground water molecules rising up through the pores in the masonry walls of buildings. These water molecules rise upwards as a result of an electro-chemical attraction between the water molecules and the mineral surfaces of the masonary wall materials. This process is called capillarity. Where a property suffers from rising damp (see our How to Identify and Treat Rising Damp guide), our chemical Damp Proof Cream can be used as an effective rising damp treatment. The chemical Damp Proof Cream and operates by lining the pores of the permeable walls with a waterproof resin creating a waterproof barrier, and neutralises the electro-chemical attraction between the ground water and masonary materials to reduce capillarity. In addition, this Damp Proof Cream works straight into the mortar bed, decreasing the need to saturate the brickwork with mass volumes of fluid which is sometimes the case with older outdated damp proofing solutions. Rising damp can result in deposits of salts and minerals into the plasterwork of affected buildings (for more information, click on How to Identify and Treat Rising Damp). Where such salt and mineral deposits have been identifed, it will be necessary to renew the plaster to prevent any future appearance of dampness caused by absorbsion of moisture from the air by these deposits. It is best practice to replace salt and mineral contaminated plaster after installing the Damp Proof Cream, when the plaster has dried out. Your specification for the replastering works should include an integral waterproofing additive, such as our Ultimate Pro Integral Waterproofer (Product No. N00210). For further information on Rising Damp, follow this link to visit our guide on How to Identify and Treat Rising Damp. For more information on the DampOut+ Damp Proof Cream product, please visit our Product Data Sheet. For detailed instructions on how to install damp proof cream, please click on the following link: How To Install Damp Proof Cream, or call us for further information. How would you rate this product in terms of ease of use? How would you rate the data supplied with this product? How would you rate this product in terms of value for money? How would you rate this product in terms of performance? How do I install Damp Proof Cream? For a detailed guide to installing damp proof cream, visit our How to Install Damp Proof Cream guide. Locate a mortar joint at least 150mm above external ground level. (For internal walls, the damp proof cream should be injected into a mortar joint as close to the internal floor level as can be achieved). Drill 12mm diameter holes horizontally in the mortar bed to a depth of 10mm less than the wall thickness at centres no greater than 100mm. Remove all the dust from the holes. If walls are dry or mildly damp, spray water into the holes until absorbed by mortar. This is a very important step as it increases the effectiveness of the product. 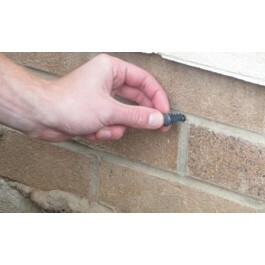 Fit Damp Proof Cream cartridge with nozzle supplied. 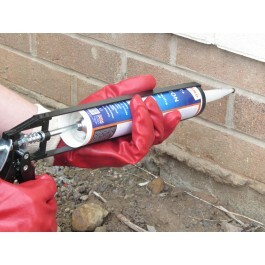 Inject the Damp Proof Cream slowly into each hole using a standard 400ml caulking gun. Extend the nozzle of the gun to the rear of the hole and slowly withdraw the nozzle as the damp proof cream fills the hole. 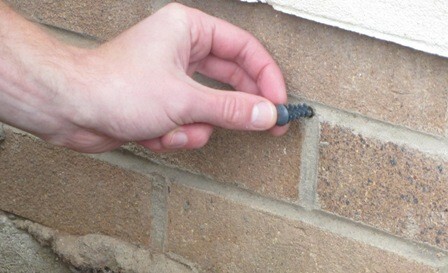 Holes in external walls can be easily capped with SkilledBuild Injection Plugs or alternatively use silicone, resin or mortar. Internal holes should be plugged or plastered over using a suitable rennovation plaster, or by simply covering with a skirting board. Note: Cavity walls will require an application of damp proof cream to both the inner and external walls. This is only a short overview on how to use the product and does not cover all the necessary points. Therefore, please click the 'Product Data Sheet' link below for more information. 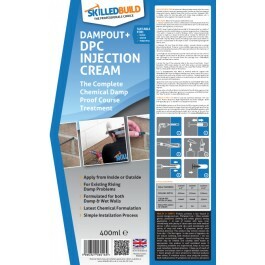 SkilledBuild DampOut+ Damp Proof Cream does not have a hazard classification and is therefore a low risk product. Silicone emulsion formulations may cause mild irritation, therefore, wear lightweight impermeable gloves when handling. Keep in original container in a safe place. Please click link below for a more in-depth safety analysis. Standard delivery rates and times apply for this product. Free Delivery for orders over £150 of combined product value. Next Day Delivery option available for £15.00.